Phoenix Aeroseal what is it & is it right for you? Phoenix Aeroseal, you may or may not have heard of it, however when you finish reading this you will hold an arsenal of information guaranteed to have you deciding when you will be having this added as part of your Air Conditioning and Heating system. Aeroseal is an exclusive patented duct work sealing system, available since 1994. Unlike any other duct work sealing system, it works from the inside out. This means it works with your already existing duct work. Utilizing special patented software, an accurate measurement is made of duct leakage in residential and commercial structures. Then utilizing the unique Aeroseal process, escaping air is put under pressure and polymer particles are caused to stick to every leak and to each other until the leaks are completely eliminated. What Kind of Savings Can You Expect with Aeroseal? It has been determined that anywhere from 25% to 40% of the cooling energy from air conditioning systems are lost through the duct work according to the U.S. Department of Energy. This means that by eliminating this waste and using the specific Aeroseal process the efficiency of your existing system just by eliminating wasted air through leaks can be improved by 25% to 40% equivocating directly into dollar and cents of the same percentages. What can I expect from my Aeroseal Experience? Sealing the air ducts in a typical home in Phoenix Arizona can be completed usually in less than 8 hrs and sometimes as quickly as 4 hrs. 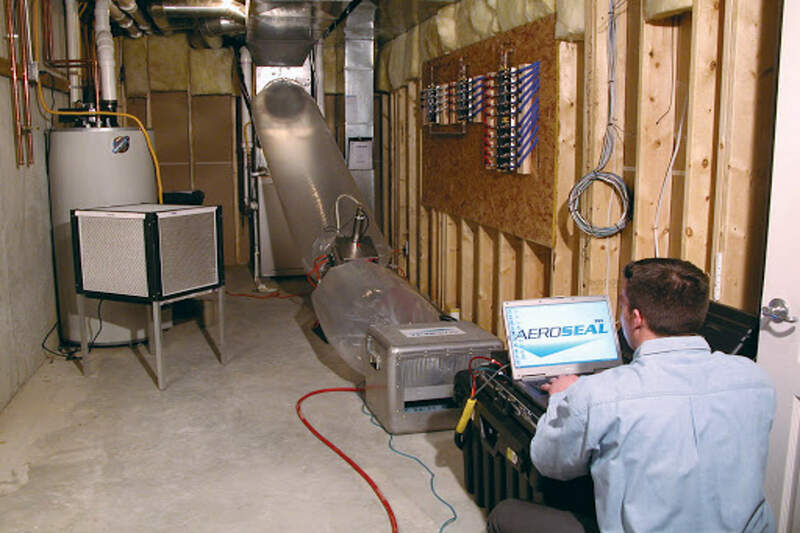 First an inspection and diagnosis will be made by an Aeroseal expert to make a complete assessment of your specific circumstances to include your specific type of duct work, the age of your structure, variances of hot and cold from one room to another, energy bills and more. Determinations will be made of any existing duct work is in need of manual repairs and replacement. Once this work is completed, the patented Aeroseal process begins. It is a simple six step process of covering vents; injecting sealant into ducts for one hour; maintaining air flow in duct work; Particles begin colliding and attaching to leaks and each other; Duct work is completely sealed and only 1-2 oz of sealant material actually remains in the ducts; final step is a computer generated verification of the effectiveness and thoroughness of the Aeroseal process. The Aeroseal process comes with an unbeatable 10 year warranty for all residential applications. It is clean, safe and UL tested utilizing an approved sealing material effectively sealing both residential and commercial building’s duct work. The “Best of What’s New” award from Popular Science magazine award as well as the “Energy 100” award from the US Department of Energy (DOE), have both been credited to the Aeroseal process. Aeroseal in Phoenix has also been designated by the DOE as one of the 23 most beneficial technologies available to American consumers. Aeroseal is considered to be the most effective, most affordable duct work sealing system available for central cooling duct work for both residential and commercial structures in Phoenix Arizona. Saving more money on any heating and cooling than any other aspect available on today’s market.